Not naughty...Just nice! What sectors topped the Radio spend charts? Welcome to Radio Trading Desk. Our mission is to provide an easy to use automated platform that enables advertisers to access affordable radio advertising, and helps broadcasters to sell their inventory. In 2004, Californian based advertising executive, Dave Newmark, recognised that buyers and sellers of last-minute unsold radio ad inventory did not have a satisfactory marketplace in which to transact. Dave conceived of a win-win platform for both advertisers and radio stations where stations compete in a live, weekly online auction to sell their unsold airtime for the next week and advertisers get greatly discounted rates on prime, guaranteed airtime. In 2005 Dave launched a US based system called Bid4Spots, a reverse-auction platform hosting weekly auctions for radio airtime. In 2007 the platform was transported across the Atlantic Ocean and introduced to the UK market by Auction Media, since then advertisers and stations alike have taken to the new trading method with hundreds taking part in the reverse auction. In 2015 US based technology solutions company, HYFN, acquired Bid4Spots and set out to build the next generation of trading platform. Whilst retaining the theme of a reverse auction marketplace, Radio Trading Desk (RTD) was launched to the UK market in May of 2016 with an entirely new user experience, remote self-service dashboard facility, and development scope to extend the automated trading model beyond a weekly auction. HYFN is an award-winning group of strategists, human behavior analysts, creators, and amplifiers that thrives on compelling and engaging audiences in meaningful ways. With a quality of service that's second to none, we create partnerships to design and develop cross-platform solutions that meet the demands of an evolving digital culture and diversified media landscape. A solutions-focused agency offering strategy, UX, design, development, and ad operations, we've found that regular collaboration multiplies what our team can do. We thrive on big ideas but also understand that the smartest concepts are supported by measurable results. Launching hundreds of projects a year, we work in lockstep toward the best solutions possible. Auction Media was chosen as the partner to introduce the reverse auction model to the UK in 2007 and since then has been responsible for well over 1 million spot buys. With a strong heritage in radio advertising and new media technologies the Auction Media team have pioneered a new model for radio transactions. The Radio Trading Desk model operates on a late sales basis where stations compete to win trade from advertisers who have submitted their budgets and campaign criteria via the RTD platform. Radio Trading Desk is a reverse-auction platform where the radio stations bid against each other for the advertisers' business, bidding the buying rate down in the process. The radio stations that offer the lowest prices for the most listeners win the advertisers' business each week. The advertisers can access hugely discounted rates on prime radio airtime and the winning radio stations get to monetise airtime that would have otherwise gone unsold. Advertisers submit their auction criteria any time before 11am on the Wednesday prior to the broadcast week. The information is then automatically sent to the stations ahead of the live reverse auction which takes place on a Thursday for the following week’s available airtime. CPTs (cost per thousands) are the long-established advertising industry standard way of expressing relative costs of media placement. To help explain, the concept of CPT is analogous to cost per pound at the grocery store. When you are buying apples at the grocery store, you instinctively know that you can judge the value of the produce based on the posted cost per pound. Radio audience size can be evaluated in exactly the same way. Just as you arrive at the total price of your apples by multiplying the cost per pound times the number of pounds, radio advertising rates are a function of the cost per 1000 listeners (CPT) times the number of listeners (in thousands). Therefore, the best expression of value in your radio buy is exactly the same as getting maximum value at the grocery store. The lowest cost per pound and the lowest cost per thousand give you the highest amount of value. Please note that in the auction creation process, CPT input is required to be 30” CPT. As per common industry practice, we use 30" CPT as the standard expression of CPT. Largest ad-hoc network of radio stations in the U.K. Please contact us for a full media kit and further information. Radio Trading Desk is a full service company, helping every advertiser construct their auctions wisely in order to meet their marketing objectives and helping advertisers understand the auction results. Moreover, every advertiser is assigned a specific Campaign Strategist to help with these tasks and, if desired, assist with creation and production of a radio commercial. Radio stations bid for those advertisers' campaigns the following day, Thursday. Auction Media’s UK based sister company Maple Street Studios are experts in commercial creation and all things audio. Maple Street have been writing and producing commercials to run on Radio Trading Desk since the UK launch of Radio Trading Desk in 2007 and know what it takes to get a consumer to respond. Due to our close working relationship with Maple Street they are also able to offer Radio Trading Desk customers an amazing offer when it comes to the cost of production, with prices starting at only £1,000 for a one voice commercial that is licensed to air across all the Radio Trading Desk stations. If you already have your commercial created, that’s great news but it’s important to check that it has the appropriate licences. In the UK commercial messages are often bought under licence for a period of 12 months and to be used on specific stations. To use your commercial in the Radio Trading Desk platform it is the advertisers responsibility to ensure that all the licenses are in place – check with the commercials producer that the advert is within date and is licensed to air on all the stations that are invited to take part in the auction (we do this by licensing the commercials to run on all Radio Trading Desk stations). For new advertisers it is often the case that payment has to be made in advance either via bank transfer or credit card payment. On occasion Auction Media (trading name of Radio Trading Desk) can enter into a credit account agreement with long-term client’s once due diligence has been performed. Payment terms will be set out and confirmed during the set up process. For more information please contact your Radio Trading Desk Account Manager. Radio Trading Desk is not a remnant platform. That is, unlike remnant advertising in which spots can be preempted or run at any time of the day or night, Radio Trading Desk buys are guaranteed to run in the same way that a scheduled buy is guaranteed to run: with the exact number of spots won by the stations in exactly the dayparts requested by the advertisers. Occasionally, however, there are a handful of spots that are missed by the radio stations. This also happens with scheduled (non-auction) buys. When this occurs, Radio Trading Desk posts the missed spots into our system and the corresponding money that would have been charged by the station is, instead, credited in the advertisers account or removed from the invoice. Radio has the ability to reach people at relevant times and places. If you want to talk to them about cars why not do it when they’re in their car? If you want to talk to them about work, then speak to them while they are there, and similarly if you want to direct them online, why not talk to them when they’re consuming a medium which enhances the online experience? Radio has the ability to do all of this, with one recent study showing that radio increases online brand browsing by an average of 52%. Radio is also an incredibly responsive medium and often first for information. 47% choose radio as the most important source of info, primarily because if there’s a breaking news story the stations have the flexibility to talk about it there and then. Radio is also able to break through in an ad avoidance world. With increasingly savvy consumers and the rise of products like on demand TV, it’s harder to offer advertisers a media solution that isn’t going to suffer from ad avoidance. Commercial radio listeners happily accept good quality radio commercials, and don’t avoid them in the way they do with other media channels. And finally, but must crucially, radio is a friend. Radio is a unique environment, as listeners feel that they have a personal relationship with the presenters; they feel that the presenters are speaking directly to them and any information they hear is trusted – in the same way that you trust your friends. It also means that listeners hear commercial messages in an environment where they feel happy, and ultimately they are then more responsive to the message. There are approximately 500 radio stations in the U.K. including Community Radio Stations, Commercial Stations and the BBC’s National and Regional networks. RAJAR, the joint industry survey between BBC and the Commercial sector, measures the listening of over 300 stations providing weekly listening figures every quarter. 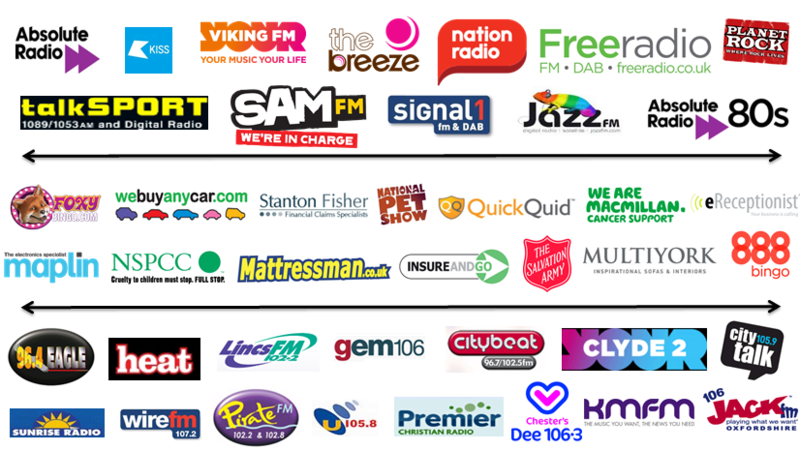 With over 200 commercial radio stations it is possible to advertise to every region of the UK. Commercial stations are categorised as National, Regional, Local, or Micro with many being available on DAB digital radio and the vast majority also available to listen to online. The Radio Trading Desk only invites commercial radio stations that subscribe to RAJAR to bid in weekly auctions as the data provides a common metric across all bidders. With an average of 120 commercial stations taking part in the live reverse auction each week the results can be extremely good. Whether you're a small, medium or large sized charity, one thing is for certain — radio advertising delivers results! Radio ads influence us all whether we realise it or not and according to studies, 62% of people in the UK are more likely to donate to a charity from advertisements on radio (compared to 26% on TV.) With that in mind, it should come as no surprise that charities make up almost a quarter of Radio Trading Desk's frequent users and have collectively invested millions over the years to get their message on airwaves and ultimately spread it to the masses. Spreading awareness nationwide isn't always easy, and more often than not, charities will need to do just that in order to increase support and donations. Nonetheless, according to recent surveys, on average 3/4 of people in the UK have donated to charity in the last 4 weeks. Why is that important? Because it just goes to show how much we all relish giving back to causes that need it most. One way to reach these truly marvellous people is through Radio Trading Desk. Using Radio Trading Desk, charities have been able to target and connect with efficiency through our access to a wide range of radio stations across the UK. After all, different stations attract different listeners, so it's important charities send the right message, at the right time and to the right people. The significantly low ad avoidance also means people rarely switch radio stations and are therefore available to listen to any message that is relevant, creative and intriguing. So you can almost guarantee high rates of OTH (Opportunities to Hear) and imminent support from the masses. As the days get colder, we reluctantly wrap our scarves and tuck away any semblance of a summer wardrobe deep in the attic. While we pile on the added layers, it's important to also note the added changes in listening habits during the festive season. Commercial radio is a playground for festive music and 43% of listeners say they tune in for this very reason. Radio's ability to entertain during the festive season and build trust, creates an ideal environment for charity advertisers to flourish. These factors resonate with listeners, which is probably why they're more likely to donate to a charity they hear on radio in the first place. For most organisations, every penny counts. This is especially true for charities, who understandably don't always have the big bucks to spend on advertising. Big spenders or not, charities continue to use Radio Trading Desk because it does what it says on the tin. It has allowed so many of our clients to create campaigns that have not only best fit their goals but equally, their budget too. Radio Trading Desk is an easy and cost-effective way to advertise on Radio. If your charity is already investing in scheduled radio commercials, they could benefit from a greater return on investment by using Radio Trading Desk alongside. We can help make your campaign work even harder by reducing your average CPT (Cost per thousand) and increasing those impacts, which means increasing the number of opportunities for potential supporters to hear your ad. It pays to have a piece of creative that stands out, but how can we guarantee that message is on point and that you'll trigger the right response? We thought we'd ask our creative team at Maple Street Creative what they think it really takes to stand out on air...and it's a lot more straight-forward than you may think. These come as a package deal. Brands need to speak in a voice that's true to themselves. People can smell inauthenticity from a mile away and it really pongs. With that in mind, it's so, so important that your brand tone is in line with your values. Be honest with your own appraisal of your brand and how these feed into your values. When it's done right, you'll highlight what you're great at and in a way that'll resonate with your audience. Be clear with what you want to achieve with this campaign. Sounds obvious. Often this can get muddled with so much else in consideration. Everything that goes into your campaign needs to help with your goal and the creative treatment shouldn't be afraid to colour outside the lines a little to get you your result. Remember, if you're speaking honestly and feeding things through in your voice and tone, there's no reason to get scared if your creative's a little well...creative! This goes without saying, but you'd be surprised how many forget this crucial creative step. It's not all about you, I'm afraid. When it comes down to it, what you have to say pales in comparison to what they, the people want to hear...so serve your audience! The more you get to know who you want to speak to, the better you can serve them something that they'll love, remember and act on. Remember, your message has to be strong enough to change people's behaviours so get to know your core demographic and aim something at them that they can't ignore. Anyone else you pick up on the fringes of this audience, what a bonus! You may be wondering why the title of this post sounds frustratingly familiar. Could it be Wowcher's 'Things that make you go WOW!' ad you're recalling? Or maybe it's Barry M's 'Things that make you go MMM' nails campaign that springs to mind? None of those? Let's go back a bit further...does McDonald's 'Things that make you go MMMMMM!' 2002 campaign ring any bells? My point is, music like C+C Music Factory's 'Things That Make You Go Hmmmm' have graced adverts for years, but with today's creative becoming, well...more creative, brands need to step up their game to stand out in a sea of soaring imagination. After all, 'Radio is the fastest growing medium' with UK advertising spend rising 5.9% in Q1 of 2018 (y/y) alone, which is a good a reason as any to make adverts that stands out on air. Maple Street Creative Connect with us! It's almost Christmas and you know what that means...Yep that's right, new deadlines are coming to town. Have unspent December budget? What are you waiting for? Book your campaign this festive period and get access to cost effective radio advertising. Apart from the cold weather and festive sandwiches, Christmas music is a core part of the joyful season. Listeners embrace music, it uplifts their mood, creates positive associations and gives Dan from Accounts endless Karaoke classics at the Office Christmas party. 47% of Radio listeners say that they discover new music on the radio, and it's still the most important platform to break new artists (RadioCentre 2017). Innovative brands including Amazon and Flash cleverly leverage music in their radio adverts to make campaigns stand out. Millward Brown (2008) found that music can greatly enhance interest and enjoyment of ads. Christmas time in ad-land is often cluttered, but it is filled with brands that apply exciting approaches to reach audiences. What we love about Radio Trading Desk is it allows advertisers to be a part of the music festivities, at a great entry point that will give Dan the Accountant more to sing about. Finance and Entertainment brands hold the top spot for Radio spenders in 2018. With £111.7m and £107m respectively, these Advertisers have recognized Radio as a nice environment to associate their brand with and in doing so, have increased their level of Radio spend by 28.04% (Finance) and 13.47% (Entertainment). Radio's ability to entertain and inform is one of the many reasons why the medium is so attractive to brands and its unprecedented access to listeners in their 'work' frame of mind is perfect for finance and entertainment brands. The Radio Trading Desk are always available to help both advertisers and broadcasters through each stage of your automated trading journey. No matter what your question you can contact us on 0207 90 7 6 80 and speak to a helpful member of the client services team. We understand that not everyone can have the same love for radio as us, so our Radio Gurus (AKA client services team) are on hand to provide advice on everything from recommended campaign budgets to uploading the commercials. Overview = Start by adding your campaign information. Our Campaign Strategists are also available to walk you through each step of your Auction set-up. Days & Times = Choose the times of the day in which you want your commercial to air. The more dayparts that you include, the more opportunities stations will have to offer you their airtime which will help generate more competition and increases the potential to achieve lower relative CPTs in the auction. Regions = This section allows you to select the regions where you would accept your commercial to air. Generally, the more regions you select, the better (regardless of your budget). This is because the more regions, the more stations are eligible to compete for your budget, hence greater supply in market and therefore lower the final auction rates/CPTs that are likely to be achieved. Leave this section as the unchanged default selection if you are looking to be in all regions, ie. a national campaign. Audience = All Auctions are run and delivered against an All Adult 15+ audience. However, here you can choose the gender, age range and socio demographic that you wish to filter stations. Selecting your target audience in this section will then automatically filter stations by their profile verses that audience. Remember the more stations you invite, the more effective the auction. Invites = Here you can see which stations are going to be invited to bid for your campaign. Enter an exclusion percentage to generate a list of stations to exclude from this auction. Stations are sorted on their profile verse the audience you selected on the previous screen with the region they broadcast within also shown. Important to note that whilst station exclusions can be based on a specific audience, the auction runs, and results are shown, against an All Adult 15+ audience. Audio = Upload your audio commercial, or attach an already existing audio file from a previous auction. If you don’t currently have audio available commercial production can be arranged via our partners, making it simple to produce and at an unbeatable price. Contact the Radio Trading Desk client services team for more information. Payment = Select your preferred payment method from either Credit Card, Bank Transfer or Credit Account. Review = Here you get to review your campaign and proceed with the booking. RAJAR (Radio Joint Audience Research) RAJAR stands for Radio Joint Audience Research and is the official body in charge of measuring radio audiences in the UK. It is jointly owned by the BBC and the Radiocentre on behalf of the commercial sector. So that small stations can be surveyed, the overall adult sample is about 110,000 per year, with each respondent only participating for one week.The sampling is devised so that each station’s sample is representative of the area it covers. The smallest sample for a station on RAJAR is 500 adults over 12 months, for stations with a TSA (Total Survey Area) under 300,000. The National stations report on a quarterly sample of approximately 26,000 adults. Affidavit A written confirmation from a media seller that confirms the actual dates and times of a schedule. AQH AQH stands for average quarter hour. The number of listeners tuning into a radio station for at least five minutes during a 15-minute period (quarter-hour) within a given daypart. Average Weekly Hours per Listener The total hours of listening to a station averaged across the total relevant population. This is calculated by dividing the Weekly Hours by the total population for the audience concerned. Broadcast Week The on-air week of a radio campaign. A broadcast week runs from Monday to Sunday. CPT CPT stands for cost-per-thousand. In the case of radio, the CPT stands for the cost to reach each 1,000 radio impacts in your target audience. For example, a £1.50 CPT means that it only costs £1.50 for every 1,000 times your ad is heard. CPC Cost per call (radio advertising) or Cost per click (online advertising). CPP CPP stands for cost per rating point. The CPP is the cost of reaching 1% of your target audience within a given market. This is calculated by dividing the cost of a campaign by the number of gross rating points. Reach/ Cume The estimated total number of people who listened to a radio station for a minimum of five minutes in a quarter hour within a given daypart. TSA TSAs are the area within which a station’s audience is measured. This is known as the station’s total survey area or transmission area. Demographic A breakdown of the audience by age, gender and socio-demographic. Frequency The number of times a campaign is heard by listeners expressed over a period of time. GRP GRP stands for gross rating point. GRPs are the Gross OTH of a campaign expressed as a percentage of the target market. One rating point equals one percent of the population. If a schedule attained a gross OTH of 200,000 for a target market of 50,000 individuals, it would generate 400 GRPs. Calculated by multiplying OTH by Weekly Reach %. Impacts Impacts are the gross number of opportunities to hear (OTH) an ad. In terms of radio research, one impact is one person’s listening to one spot. These are added together to give total impacts for an advertising campaign, or total impacts for all commercial airtime on a certain station. Calculated by multiplying OTH by Weekly Reach (‘000s). Market The city, town or region in which the majority of the broadcaster’s audience resides. OTH OTH stands for Opportunity to Hear and represents how many times a listener is likely to hear an ad. Population The number of people who live within the TSA of any given station. Radio Spots Pre-produced commercials recorded by an advertiser. Reverse Auction An auction where sellers (broadcasters) bid for the buyers' (advertisers) business and the lowest price (CPT) wins. Spot Length The duration of the commercial (typically 30 seconds). Traffic Instructions Written instructions given to a broadcaster on how commercials are to be inserted (including commercial title, days, times and rotation). Weekly Reach Weekly reach represents the number of people who tune in to a radio station within at least 1 quarter-hour period during a week. Weekly Reach % The Weekly Reach expressed as a percentage of the Population within the TSA. In a standard auction, the buyers do the bidding and the highest price wins. In a reverse auction, the sellers do the bidding and the lowest price wins. With the Radio Trading Desk, advertisers are the buyers, radio stations are the sellers, and the “price” is the CPT (Cost Per Thousand). Click the "Sign Up" link. From there, follow the step-by-step instructions to register. You will receive an email confirmation. Then log in to create your first auction. What if I want to run spots during a particular week, when would I create the auction? Your auction must be submitted by Wednesday at 11am prior to the following broadcast week. Broadcast weeks run Monday - Sunday. Bidding occurs on Thursdays from 10am – Noon. How do I view the results of my auction? Auction results will be emailed to you on Thursdays at 1pm or you can log in to view the results any time after the auction closes. How will I know if the spots aired? Radio Trading Desk receives confirmations from the bidders. Confirmation documents with the dates and times the schedule ran on are sent to Radio Trading Desk two weeks after the campaign aired. Radio Trading Desk then reconciles these confirmations with the auction results. In the rare event that a schedule does not run as awarded, you will be contacted to discuss either a credit note or reduction in invoicing. In addition, Radio Trading Desk informs all bidders that schedules cannot be pre-empted. Broadcasters that fail to comply may be suspended for 1 month. No, you are not obligated to participate. You create auctions based on your company’s advertising needs. How much do I have to spend in any given auction? There is a £2,000 minimum spend per auction. Can I specify where my schedule will run? No, but you can specify the categories, formats and markets that are eligible to participate. Go to "My Profile" under "Account Settings". Enter your new password, re-enter to confirm and click “Save” to save changes. From the login popup, click "Forgot Password?". Enter your email address, and hit the "Recover" button. Go to "My Profile" under "Account Settings". Make changes and click “Save” to save changes. Go to "Users" under "Account Settings". From the profile screen, click “Add New User” and enter the new user information, select a privilege role and click “Save” to save changes. What are privilege levels / roles? Privilege levels specify the allowable operations for each user. - Advertiser Executive: Can perform all actions. - Advertiser Employee: Can manage spots, view auctions, and view reports. - Broadcaster Executive: Can perform all actions. - Broadcaster Sales: Can bid on auctions for stations. - Broadcaster Traffic: Can download spots, manage air times, and view reports. How do I edit my auction after I’ve submitted it? Go to "My Auctions" and click the hamburger icon (3 vertical lines) next to each auction to open the action menu. From here click "Edit" to modify an auction. Only auctions that have not ran yet can be edited. Is there a minimum weekly expenditure required? There is a £300 minimum expenditure required. How do I pay for my spots? On setting up an auction you will be required to select the payment method. Payment can be via Credit Card, Bank Transfer, or On Account. Auctions will not run until payment has been confirmed as received by a member of our customer service team. What happens if some of the budget isn’t spent? Unspent budget can be used for future auctions in the form of a credit note or can be refunded on request. If paying On Account only the amount spent will be invoiced. Can I cancel an auction after depositing the funds? The deadline for auction cancellations is Wednesday at 11am of the auction week. Prior to Wednesday 11am of the auction week: Log in and click "My Auctions." Select the auction you would like to cancel and go to the final step. There you will see a "Cancel" button. After Wednesday 11am: Call your Radio Trading Desk Account Manager or Customer Service 0207 90 70 60 80 for assistance. If you cancel an auction, your funds can either be applied to your next auction or refunded. Who compensates the Radio Trading Desk for this service?? Radio Trading Desk fees are paid by the sellers. The rates are confidential per an agreement between the Radio Trading Desk and the sellers. This allows the Radio Trading Desk to pass the savings on to the advertiser.